Using the master pattern here, this hat knits up very quickly and makes a great small gift. It has a paper-bag top that requires no decreasing. 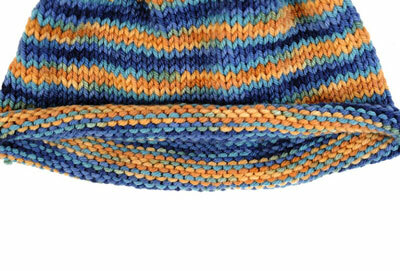 Simply knit the tube as long as you want, bind off, and close the top of the hat with a simple tie. Yarn: Desired yarn in the amount specified. These estimates are for a hat with a ribbed brim. The hemmed and rolled brims require slightly more yardage. Hat A: Schaefer Yarns Chris (80% extra-fine merino wool superwash/20% nylon, 215 yd. per skein), 1 skein in color Julia Morgan. This hat, knit in size M, was worked at a gauge of 5 stitches per inch on a US 5 needle. Hat B: Valley Yarns Valley Superwash (100% extra-fine merino superwash, 97 yd. per skein), 1 skein in color Blue Mist. This hat, knit in size S, was worked at a gauge of 5 stitches per inch on a US 5 needle. If you are working a rolled stockinette brim, you will need another needle of the same type, one size smaller than that used to obtain your desired gauge. You can work this project using any of the circular knitting methods. However, the smallest size may be difficult to work on a 16-inch circular because the stitches may be stretched out along the needle. 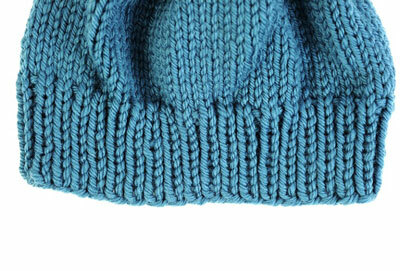 It is easiest to knit small hats using the magic-loop method with one long circular needle. Determine the desired circumference for the hat. Most hats should be knit with negative ease. Measure around the widest part of the intended wearer’s head and subtract 1⁄2–1-1⁄2 inches from that measurement to calculate the hat circumference. A hemmed brim is not as stretchy as a rolled or ribbed brim, so it’s best not to include too much negative ease when using this hem. Choose a yarn that is both machine washable and soft against the skin. Superwash yarns save moms some work, and softer yarns make hats that kids will wear. If a child has allergies or sensitivities to animal fiber, choose a cotton or acrylic yarn that meets the criteria above. If the hat will be worn in colder weather, stick with heavier yarns: bulky, worsted, or DK weight. Because this project is so simple to knit with very little patterning, it’s a great place to use a variegated or self-patterning yarn. Using the long-tail cast-on, cast on the number of stitches specified in the following table for your gauge and desired hat size. Arrange your stitches on the needles according to your chosen circular knitting method. Join for working in the round, being careful not to twist the cast-on around the needles. Place a marker to indicate the end of the round. Follow the directions here for the ribbed brim. *Knit 1, purl 1; repeat from * to beginning of round. Other rib patterns that are good for the bottom of a hat are 2 ×2, 2 ×1, and 3 ×1. Remember that your chosen rib pattern must fit evenly into your number of cast-on stitches. Continue working in rib for 1-1⁄2 inches or the desired length from the cast-on edge. Using a needle one size smaller than the one you will use for the body of your hat, knit for 2 inches. Change back to the larger needle and work the remainder of the hat. Work in stockinette stitch until the hat measures 1 inch from the cast-on edge. Purl 1 round to create a turning ridge. Work 1 more inch of stockinette stitch. 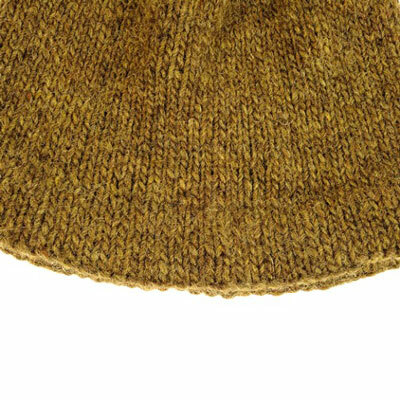 Work in stockinette stitch until the hat measures 6-1⁄2 (7, 7-1⁄2) inches from the edge of the brim. If using a hemmed brim, measure from the purled turning round. If using a rolled brim, measure from the bottom of the rolled brim. If using a ribbed brim, measure from the cast-on edge. If you worked a hemmed brim, fold the bottom edge up inside the hat along the purled turning round. Loosely whipstitch the hem in place on the wrong side. Cut two or three strands of yarn about 12 inches long. Holding these strands together, tie them tightly around the top of the hat about 1-1⁄2 inches from the bound-off edge. Using a seaming needle, take the yarn ends to the inside and weave them in.